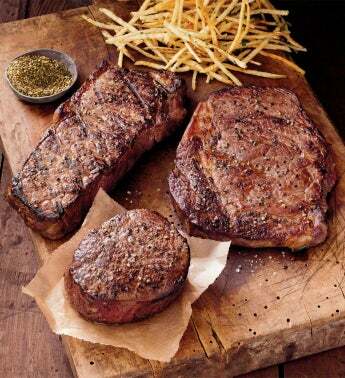 When only the absolute best will do, choose this hearty collection of the finest Stock Yards® USDA Prime steaks. You'll get two or four each of our flavor-filled Center-Cut New York Strip, perfectly marbled Boneless Rib Eye, and supremely tender Complete-Trim Filet Mignon, all wet-aged to perfection for 21-30 days. Comes with our a tin of our Peppercorn Steak Rub that adds just the right amount of flavor.